Thousands of Occupy Wall Street activists flooded Times Square on Saturday in a dramatic protest against the upper one percent. Thousands of Occupy Wall Street protesters flooded Times Square Saturday to oppose an economic system the activists say isn’t providing for the “99 percent” of American citizens who aren’t hedge fund managers. What unfolded was a dramatic confrontation between the NYPD and protesters in which individuals were almost mowed down by police motorcycles, nearly trampled by horses, and ultimately ninety-two activists were arrested. The original plan was for protesters to march from Washington Square Park, where a gathering had been scheduled earlier that afternoon, to 42nd street. NYPD strictly enforced the “march only on the sidewalk” rule, and I saw two young men arrested for violating that policy when they wandered into the street. Additionally, an Italian cameraman had his press pass ripped from his neck when he went into the street to film the police. NYPD was very careful to specifically (and loudly) warn the remaining journalists that they too could have their passes seized at any time if they wandered off the curb. The march continued onward despite the arrests toward the goal: Times Square. 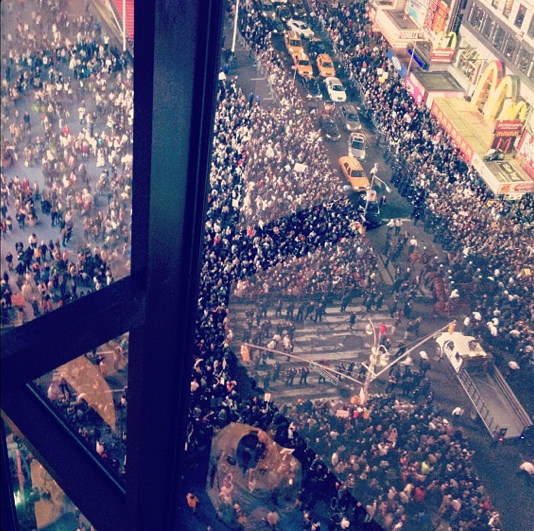 Plans changed quickly when OWS reached 42nd street and found it netted off by the NYPD. 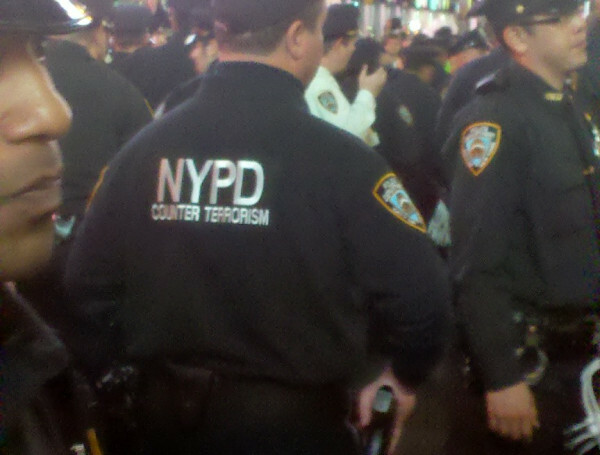 Police instructed the activists to walk up to 46th street and approach Times Square from that direction. As the group advanced along 46th street, however, chaos briefly broke out when a group of motorcycle-riding officers surged forward, nearly running over the protesters, who cried out in a mix of fright and anger. A terrifyingly claustrophobic experience ensued in which the NYPD penned protesters with barriers on either side of Seventh Avenue. Activists were pressed against one another, unable to move without shoving past one another. Rather than do that, many sat down to peacefully protest. When I heard reports the horse-mounted police were being dispatched, my heart sank. I have yet to see any situation in which horses make an activism situation less chaotic and less dangerous. Of course, that’s the point. Horses can be used as deadly weapons in order to intimidate activists. I’m always reminded of the terrible case of Nick Morgan, a veteran from Iraq Veterans Against the War, who had a police horse trample his face when he was protesting during the final 2008 US presidential debates at Hofstra University. Police horses are deadly weapons, for sure, but protests are also a terrifying experience for the horses themselves. As is clear from the videos emerging from Saturday, the horses are obviously agitated by all of the movement and noise as they rock to and fro, looking ready to spook and charge at any moment. And of course, that’s what happened. Either because the horses freaked out and lunged forward or an overzealous officer decided to push back the crowd, the police ended up riding the horses into the sea of people in a horrifying moment that out of sheer luck didn’t result in any injuries. Ryan Devereaux from Democracy Now! tweeted that he overheard a NYPD whiteshirt announce by megaphone “That horse is gonna hurt” and that one of the horses actually fell during the ordeal. Truthout’s Matt Renner later tweeted that he heard directly from the police the horse had to be put down. As I pushed my way through the crowd, I saw extremely young children present. Two young children, no older than 4 or 5, sat on the sidewalk, obliviously playing with some small toys. One woman, a tourist, who got swept up with the thousands of protesters, was pushed against the gates cradling her newborn infant as she desperately tried to negotiate her release with the NYPD. The last I saw, she was still trying to catch the attention of an officer. Things reached their climax when, following the millionth time the NYPD barked, “Back up!” to the activists, the protesters in a fit of defiance began chanting at the police “YOU back up!” Well, I thought, here comes the pepper spray, or the tasers or the mass arrests. But the higher-ups in the NYPD seemed to have other plans. At around 9:20 pm, the police suddenly unkettled the protesters, and though ninety-two individuals were arrested, those mass arrests that I thought were utterly inevitable never came. It appeared, for the second time in three days, OWS protesters overwhelmed the NYPD. First, they successfully delayed the eviction of Liberty Park, and now they had occupied the single biggest tourist attraction in New York City and walked away from the experience without hundreds being incarcerated. Either that, or the NYPD, after the pepper spraying, Brooklyn Bridge fiasco, billy clubbings, beating up a HIV+ activist, and running over a lawyer, has had its fill of bad PR. Amped from another perceived victory, around a thousand protesters gathered in Washington Square and briefly humored the idea of launching a second occupation. However, ultimately the body voted against it since they decided there weren’t enough people present to successfully hold the park. Regardless, fourteen individuals decided to stay and were eventually arrested.